From July 21st to July 25th, the Worker Institute hosted "With Women We All Rise," the 43rd Annual United Association for Labor Education (UALE) Summer School for women in unions and worker organizations. 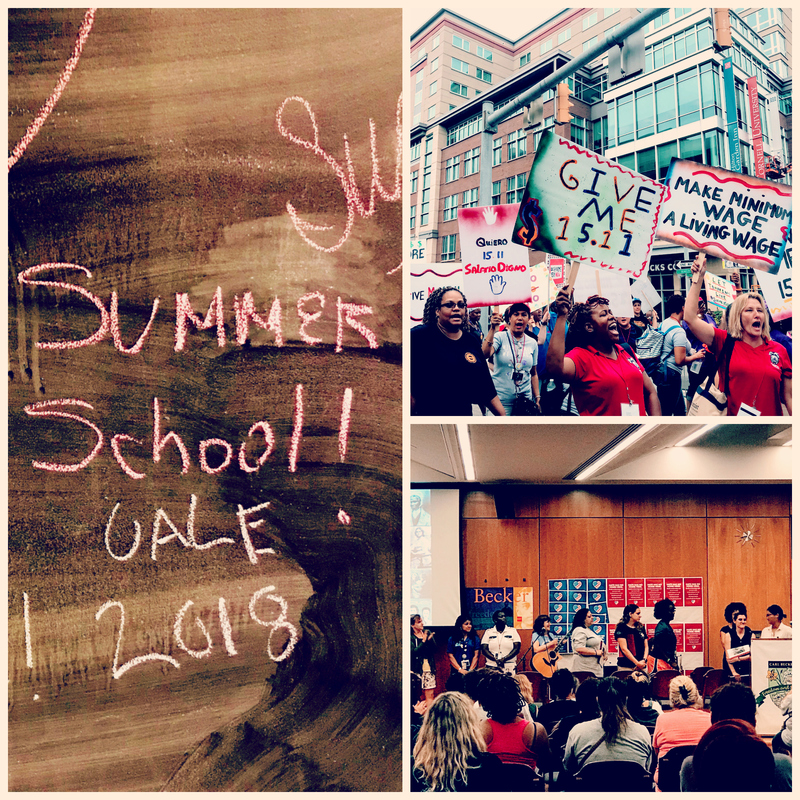 From July 21st to July 25th, the Worker Institute hosted the 43rd Annual United Association for Labor Education (UALE) Summer School for women in unions and worker organizations. This years theme was “With Women We All Rise,” reflecting the need to stand up to the forces that divide us - the rise of racism, anti-immigrant feelings, homophobia, and of discrimination against women. UALE is an organization of labor educators who advocate for education as an essential tool in the process of union transformation and work to develop new leadership.summer school was launched in 1975 and was designed to bring together rank and file women workers officers and staff to strengthen the knowledge of the labor movement and develop skills that will enable them to become active and influential in their unions. The schools are a place where women unionists can share experiences and give one another support. Hosted on Cornell’s Campus, faculty and students stayed in the Carl Becker House and classes were held in Ives Hall and the ILR Conference Center.Participants will include women who work in the construction trades; as bus drivers, teachers, and organizers; as union presidents and administrative support; from PA, NJ, CT, NY, and New England. All of whom seek to improve their knowledge and skills in order to serve their coworkers and communities better. It is a place for building solidarity across unions and alternative labor and community organizations. On Sunday during the Opening Session, KC Wagner, Co-Chair, Equity at Work ILR Worker Institute led a discussion fo the #MeToo movement and sexual harassment in the workplace. Students participated in leadership classes named after famous women leaders in the labor movement, including Ida Torres whose motto of “never let a sister walk alone” was a defining theme for the week. On Tuesday, July 24th, participants in summer school joined with the Tompkins County Workers’ Center and Cornell Graduate Students United (CGSU) to hold a rally the Bernie Milton Pavilion on The Commons in Ithaca, to highlight the community-based movement to raise the minimum wage in Tompkins County to a Living Wage. According to the Alternatives Federal Credit Union biennial Living Wage Study, the local Living Wage is currently $15.11 an hour, if a worker has no health insurance benefits at work. This is enough for a single person with no dependents to afford basic costs of living in Tompkins, and the current New York minimum wage falls woefully short of meeting people’s needs in this community. The summer school featured classes including internal organizing, legal rights, grievance handling, bargaining for the common good, plenary sessions, and a joint action. Courses also explored ways to address discrimination, harassment, and isolation in the workplace. Students participated in skills-building workshops, cultural activities, and educational sessions on current labor challenges taught and shared by labor educators, union staff and officers, and worker organization activists. Participants left with action plans to bring back to their local unions and their communities. Faculty included Kim Cook of the Worker Institute and Aliqae Geraci, Assistant Director of Research and Learning Services at Cornell University’s Catherwood Library. The school was dedicated to Amy Dietz, Senior Lecturer in the School of Labor and Employment Relations at Penn State.